Chorizo is probably the most well know Spanish sausage and comes in many forms. There are soft ones for cooking, and various grades of slicing chorizo, right up to the best, chorizo de bellota, which is made from free range pigs that have been allowed to roam free in oak forests and eat acorns – the fat from bellota (acorn) pigs is rich in oleic acid, like olive oil – it’s good for you! 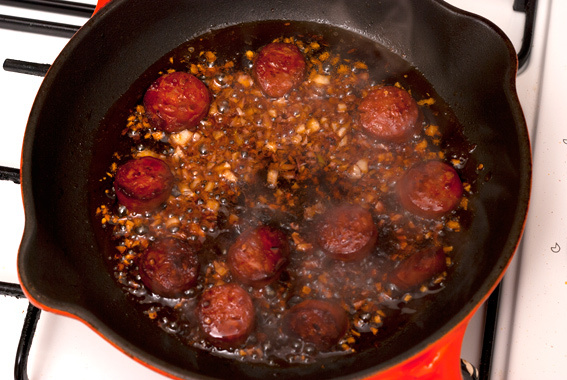 Chorizo Al Vino (with wine) is a very simple tapa and is a good way to make an average slicing chorizo taste great. My recipe isn’t authentic, but it does add to the existing flavours without any mucking about. The real thing is just cooked with olive oil and wine. 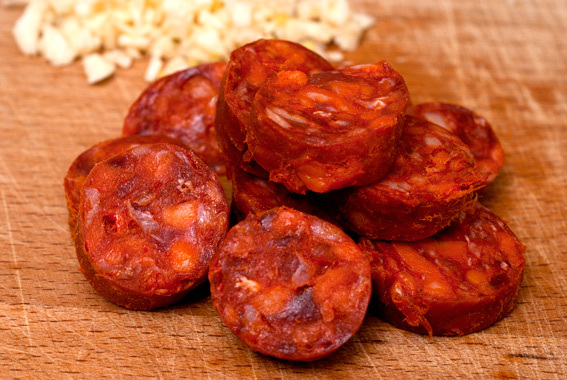 Buy an ordinary hot (picante) chorizo ring and slice it into one quarter inch pieces. Remove the rind, it’s not organic. Heat a cast iron frying pan and add a little olive oil and the chilli when it gets hot. Brown the chorizo lightly on each side and when almost done (see my picture), add the chopped garlic – if you add the garlic at the beginning it will burn. 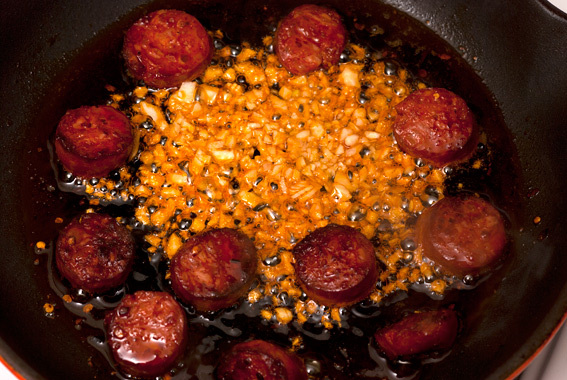 Just allow the garlic to take some colour from the paprika in the chorizo before pouring in the wine. Allow the alcohol in the wine to reduce for a minute or two and that’s all there is to it. You can flame the red wine because of the alcohol and fat content – I have seen recipes which suggest doing that. I don’t think it’s necessary, but it can happen if you are not paying attention. Chorizo Al Vino is normally served in a typical, Spanish, brown clay, dish with bread – dip the bread in the sauce, it’s amazing! If you don’t use all the sauce up, it’s great to add to Napoli sausages (it really enhances their spicy flavour). I had hot Chorizo Al Vino and hummus sandwiches last week and the only word to describe the taste is umami. This entry was posted in Meat, Recipes, Spanish and tagged acorns, bellota, chilli, chorizo, garlic, oleic acid, olive oil, paprika, pigs, red wine, Spanish, tapas, umami. Bookmark the permalink.